Next week is National Anti-bullying Week. This year the theme is All Different All Equal. We will be joining in here at Osbaldwick Primary and engaging the children in a number of activities as well as having special assemblies to promote this. 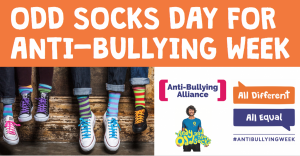 As part of raising the profile this year children are being encouraged on Monday 13th November to wear odd socks in order to high light diversity. There is no charge, this initiative is about raising awareness and respect for one another rather than fund raising. We will explain to the children in advance that on Monday they can wear odd socks as we as we launch our special week. With appreciation for your support as always.